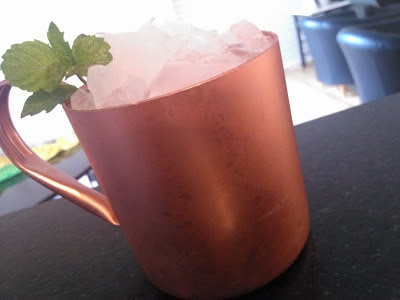 Then overfill with ice like you would a mint julep and garnish with a mint sprig. This cocktail is all over the place. It's called a Pontarlier Julep because Pontarlier is the traditional French home of absinthe distillation, and the cocktail is aptly named. The absinthe comes through in spades. The smell is of absinthe and citrus, and then the Aperol begins to come through, too. The orange additions don't overtake the Aperol and absinthe, but they complement nicely, and the sweet vermouth and gin appear remarkably absent, merely there as team players for the absinthe and Aperol. Overall, Pontarlier Julep is a great cocktail. Refreshing and cooling, perfect for a Houston summer day. Note: if you don't have orange flower water, I would just omit it. I know absinthe and Aperol seem like an odd couple, but don't let the strange sounding cocktail mixture keep you from trying it.